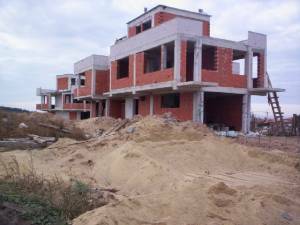 Houses in Sozopol - Property in Bourgas, house in Bourgas, agricultural land for sale in Bulgaria. Cheap Bulgarian Property. Two similar, three-storey houses in the seaside town and resort of Sozopol. LOCATION: The town of Sozopol is the administrative centre of Sozopol Municipality within Bourgas District. Sozopol is the oldest, seaside town in Bulgaria, located on a point in the southernmost part of Bourgas Bay. Its name has Greek origin and means the Town of the Deliverance. The Old Sozopol is an architectural and archaeological reserve with characteristic of Sozopol XIX-th century's houses, built of stone and wood. Walking along the narrow, cobbled streets, you feel in a romantic way. One could have various sea delicacies and enjoy the stunning view in cosy, small restaurants, situated on the seafront streets. The modern part of Sozopol has incredibly beautiful architecture and you can't choose where to lay your eyes first. There are lots of grand hotels, hostels and holiday camps. In the surroundings of Sozopol the following campsites are situated: Kavatsite (The Poplars), Smokinya (The Fig), Veselie (The Joy), Gradina (The Garden) and Zlatna Ribka (The Goldfish).They offer bungalows of different rates, caravan sites and clean, wide beaches. The holiday camp of Duni is 7 km away from Sozopol and one of the sought-after beach resorts in Bulgaria due to its gorgeousness and purity. PROPERTY DESCRIPTION: A unique opportunity to purchase two similar, brick, three-storey houses, which are still under construction. Each house offers 70 sq. m. of living area. The property, connected to the sewage, is in an elevated location with delightful views. The houses have an attractive architecture and are being built to the high contemporary standard. The property is reached via an asphalted road. The price concerns finished houses.